Stay up-to-date on Kusiak Music projects, screenings, creative collaborations, and other news. I've been going to the Production Music Conference for a few years now, and the attendance seems to grow exponentially each time. This year the foyer was so packed in between sessions that it was sometimes hard to squeeze through! The quality of the workshops was great, divided into two tracks (creative and business). I was there primarily for the business angle, as there's always more to learn about sub-publishing, metadata, and the direction of the industry in general. My daughter Jessie (in training to be the Kusiak Music Library manager) met me in L.A. and we navigated the conference together, sometimes splitting up to catch both sessions. The conference was at the Loews Hollywood and we had 10th floor rooms with views of the Hollywood sign in one direction and the pool and enormous Egyptian-themed mall complex on the other. All of the panels that we attended had information that Jessie and I could use in developing and improving Kusiak Music Library. The session that stuck with me most was "Gratis and Multi-Title Licensing," which revealed an unfortunate practice that is becoming too common – clients wanting music for free or wanting to share or own the publishing. Pretty disheartening, but we composers need to stick together and resist this development. 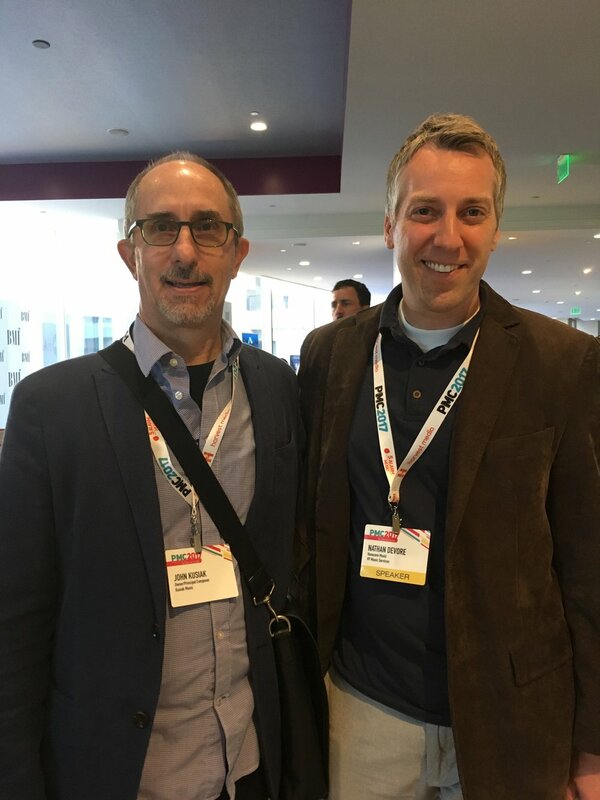 It was great to reconnect with Nathan DeVore who was moderating the panel on "Valuing Your Performance License in New Media." Nathan interned for me when he was a student at Berklee College of Music and was a great help and always a positive presence. Glad to see him have so much success with Vanacore Music!